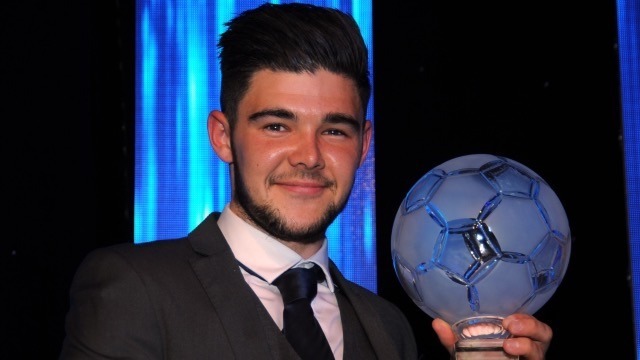 Alex Mowatt has been crowned as the Leeds United Player of the Year for the 2014/15 season after topping the official vote by the club’s supporters. Alex’s achievements were also recognised by his team-mates at Saturday’s End of Season Awards dinner as he scooped the Players’ Player of the Year award on a memorable night for the 20-year-old Academy product. Elsewhere, fellow Thorp Arch graduate Lewis Cook claimed the Young Player of the Year award to cap a remarkable breakthrough season for the 18-year-old, while Rodolph Austin was awarded Goal of the Season for February’s stunning strike against Watford at Elland Road. Saturday night also saw the introduction of a new annual award, The Bobby Collins Unsung Hero , which was collected by Academy kitman Shaun Ford after being put forward by head coach Neil Redfearn. Almost 1,000 supporters were in attendance at the Centenary Pavilion to mark the end of the 2014/15 season after over 15,000 fans across the world had cast their votes for the individual awards. Voting for the Player of the Year award was particularly tight after being whittled down to a five-man shortlist, with Mowatt beating Cook, Marco Silvestri, Sam Byram and Luke Murphy to the prestigious title. The midfielder joins an illustrious list of past winners including the likes of Peter Lorimer, Norman Hunter, Eddie Gray and Allan Clarke. In only his second season as a first-team regular, Mowatt found the net nine times in 38 appearances, including a number of spectacular efforts, and achieved international recognition for England Under-20s along the way. His match-winning strike at Wigan was among the nominees for the Goal of the Season award, and his impressive finishes against Wolves and Charlton could quite easily have been included too, but it was Austin who scooped the prize which had been held by Ross McCormack for the previous two seasons. The Jamaican midfielder pipped Mowatt, as well as the other nominees Giuseppe Bellusci (vs Bournemouth away), Luke Murpy (vs Bournemouth at home) and SouleymaneDoukara (vs Blackpool at home) for his unstoppable, dipping strike against eventual promotion-winners Watford in late February. Cook, meanwhile, was voted as the Young Player of the Year, ahead of Mowatt, Byram, Charlie Taylor and Adryan, following an eye-catching first season with the senior squad. Having made his debut aged 17 as a substitute at Millwall on the opening day, the England Under-19s star and recent Championship Apprentice of the Year winner soon established himself as a key part of the side, making 38 appearances in total. And someone who has worked closely with Cook throughout his progression at Thorp Arch, Shaun Ford, was presented with the inaugural Bobby Collins Unsung Hero Award for his contribution to the club behind the scenes. Shaun, an immensely popular figure at the training ground, initially joined as a driver for the young players at the Academy back in 2007 and now occupies the role of Academy kitman. Redfearn, who nominated Shaun for the award, said: “Shaun Ford is one of the types of guys that every football club needs. There’s no job that he can’t do and there’s no job that he turns down. “He’s here first thing in the morning when I first come in and he’s still there when I’m going home after everybody’s gone after training. “Just his all-round manner and how he is around people at the club... He’s just an absolute delight. Keep a close eye on leedsunited.com in the coming days for reaction and exclusive photos from Saturday night’s End of Season Awards Dinner.